Will Senate Move to Stop U.S. 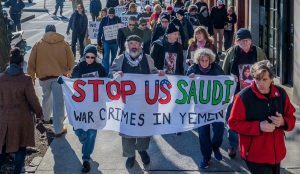 Backing for Saudi War on Yemen? Hakim is chair of the Yemeni Alliance Committee [see on Facebook], which is working with other groups including Just Foreign Policy and Action Corps. The groups noted that Trump last week defended U.S. government support for the Saudi-led war. “Last week activists in San Francisco and Los Angeles succeeded in obtaining support from House Democratic Leader Nancy Pelosi and House Intelligence Committee Ranking Member Adam Schiff for a bill to end U.S. involvement in the Saudi-Houthi war in Yemen. The legislation invokes the War Powers Resolution of 1973 to end all U.S. support for the war in Yemen. Tuesday [Senate Minority Leader] Schumer tweeted his support for the Senate version, SJRes54, but he, Sen. Menendez of New Jersey, and many other senators have yet to co-sponsor the bill.